Description: Dioecious shrub 0.5–4 m high. 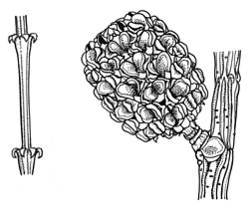 Branchlets to 33 cm long; articles 10–25 mm long, 0.8–1.5 mm diam. ; teeth 7–10, 0.4–1.3 mm long. Cones on peduncle 2–9 mm long; cone body 8–27 mm long, 7–14 mm diam. ; bracteoles truncate to obtuse. Samara 3.0–7.5 mm long. Distribution and occurrence: Northeastern NSW: McPherson Range to Koonyum Range, Gibraltar Range, Ebor, Big Nellie N of Taree and inland to Torrington, Ashford and Howel areasl. Also in SE Qld. Grows on volcanic outcrops in exposed situations.